Clinical Staff — Dankmeyer, Inc.
We are proud of our expert professional staff at Dankmeyer Inc., who form a part of your multidisciplinary team. Whether you are our patient, or refer a patient to Dankmeyer, you can rely on a combined 175 years of professional practice and dedication to patient care and service. Our Certified Prosthetists and Orthotists have been educated at a number of fine institutions across the United States, but are all essentially home-grown! As children, some aspired to be artists, dancers, musicians, professional athletes, engineers and teachers. Ultimately, they were led to Prosthetics and Orthotics by their combined passion for hand skills, solving complex problems and a desire to enhance people's lives through the use of well designed and crafted prostheses and orthoses. Our mission is to offer comprehensive and custom prosthetic and/or orthotic solutions for improving each patient's ability to function at home and in the community. Here are some things you might not know about our clinical staff. Mark is a Certified Prosthetist Orthotist and a Licensed Physical Therapist, who has been with Dankmeyer since 1992. Originally from Newark, Delaware, Mark has a BS with a Certificate in Physical Therapy (PT) from the University of Delaware. It was during his internships there that he had several experiences with amputees. Later, when he began working in PT at Johns Hopkins, he started covering the Amputee Clinic. After meeting Charles Dankmeyer, he decided to go into the prosthetics program at Northwestern University Medical School Prosthetics and Orthotics Center, and earned a Certificate in Prosthetics there. Eventually he left Hopkins to come to work full time at Dankmeyer, Inc. where he became Clinic Director. During that time he completed his MBA at The Johns Hopkins University. He is currently adjunct faculty at the University of Maryland School of Medicine School of Physical Therapy and The Johns Hopkins University School of Medicine, Department of Physical Medicine and Rehabilitation. A number of our patients know that Mark is a runner, who has completed several marathons. Joseph is a Certified Prosthetist. Joseph is one of our long-term Dankmeyer staff, having been with Dankmeyer since 1980, first as a technician, then as the Production Manager overseeing all aspects of device fabrication, and also a prosthetist. Currently, Joseph is the Chief Operating Officer. He has an Associates Degree in General Studies from Essex Community College in Essex Maryland, and a Certificate in Prosthetics from Northeast Metro Technical College in Minnesota. Joe is originally from Long Island, New York. He came to Baltimore as a young man and recalls working many summers at Dankmeyer scrubbing and cleaning floors. As a technician at Dankmeyer, he liked working with his hands, and decided to become a prosthetist. P&O combines his love of teaching, carpentry and hand skills, and helping people overcome their physical challenges. Joe played men’s fast pitch softball competitively for over 30 years. Charles is a Certified Prosthetist Orthotist and a native of Baltimore. He has been with Dankmeyer since joining his father, Herb Dankmeyer, in the business as a young man - first cleaning the shop and moving the wood then used in prostheses. He began work as a CPO after receiving his BS from New York University and his Certifications in Prosthetics and Orthotics. During his tenure at Dankmeyer, Charles has served in a number of positions with various organizations, including the American Orthotic and Prosthetic Association, the American Board for Certification in Orthotics and Prosthetics, the American Academy of Orthotists and Prosthetists, the Maryland Rehabilitation Association, and the Veterans Administration. Charles is a past President of the American Orthotic and Prosthetic Association. At Dankmeyer, Charles has been a part of a number of “firsts” in P&O development, including the proportional switch control, single control site controlling multiple joints, and the powered shoulder. There are also a number of advances which Dankmeyer introduced regionally - totally plastic sockets, total contact below knee sockets, hydraulic knee control systems, pneumatic knee control systems, and Myoelectric controlled upper limb prostheses, among many others. Charles enjoys boating and sailing and is active in several conservation efforts in the Bay area. Angie is a Certified Prosthetist Orthotist, who has been with Dankmeyer since 2006. A native of Linthicum, MD, her high school interests in science and math led her to study biological engineering in college, but she found P&O to be a profession where she could combine these interests with her desire to interact with patients, and most effectively help change their lives. She has a BS in Biological Resources Engineering from the University of Maryland, and Post-Baccalaureate Certficates in Prosthetics and Orthotics from California State University and Northwestern University respectively. She is adjunct faculty at the University of Maryland School of Medicine School of Physical Therapy. Angie enjoys playing ice hockey locally in a number of mixed leagues, when she is not coordinating patient/Dankmeyer employee activities. You can read more about her past efforts under Team Dankmeyer. Sheryl Sachs (Sheryl Nathanson), MSPO, CPO, joined Dankmeyer in 2011. She completed her undergraduate work at University of Maryland, College Park, and graduated from the Georgia Institute of Technology with her Master of Science in Prosthetics and Orthotics. Sheryl completed both her prosthetics & orthotics residencies at Dankmeyer. 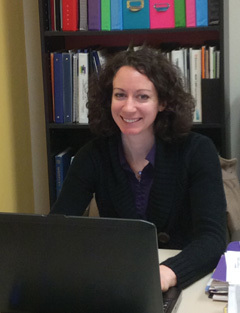 She is the lead practitioner and runs our North Baltimore office located on the main campus of Sinai Hospital. Sheryl is an active member of the American Academy of Orthotists and Prosthetists (AAOP). She is a former liaison for the National Commission for Orthotic and Prosthetic Education (NCOPE) and currently serves on the NCOPE Residency Review Committee. She is also active with the American Orthotic & Prosthetic Association (AOPA), serving as a state representative and participating in their annual Policy Forum, advocating for her patients on Capitol Hill. Jed is a Certified Prosthetist Orthotist who came to Dankmeyer in 2013. While in high school and exploring potential careers, Jed stumbled across a newspaper article about amputees, which triggered his interest in the field. His interest grew into a passion while he volunteered and later worked as an apprentice at a local prosthetic and orthotic facility where he grew up in Bethlehem, Pennsylvania. He eventually made the decision to travel to Seattle, Washington to attend the University of Washington where he received his BS in Prosthetics and Orthotics. His prosthetic residency was completed at the Rehabilitation Institute of Chicago and he completed his orthotic residency at Dankmeyer. He has always enjoyed working with his hands and interacting with patients. Outside of work, Jed can be found exercising or spending time outdoors. He enjoys mountain biking, snowboarding, and working on his motorcycle. Mary is a Certified Prosthetist and Maryland native who has been with Dankmeyer since 1999. Early, she wanted to be a robotic engineer and work with animatronics at Disney World. While researching other engineering options at college, she came across the field of prosthetics. She spent two summers volunteering at Dankmeyer, working in both the lab and patient care areas. She went on to complete her BA in Human Services Counseling from Metropolitan State University in St. Paul, Minnesota, while consecutively completing her Associate of Arts in Prosthetic Technology at Century College. She stayed on at Century College to complete her Diploma in Prosthetic Practitioner Advanced Specialty. Mary returned to Baltimore, and to the place which inspired her career path, to complete her prosthetic residency at Dankmeyer. 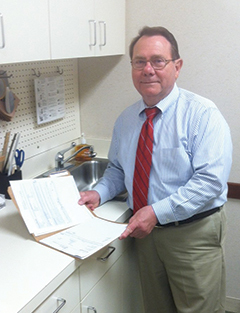 Mark is a Certified Prosthetist and Board of Certification Orthotist, who has been with Dankmeyer since 1980. Mark was born in Baltimore and spent most of his childhood in Pasadena, MD. Mark's father was a musician, an artist and sculptor and Mark learned how to work with plaster and molds as he was growing up. Since he enjoys working with people and working with his hands, O&P was the ideal career choice. He started as a technician at Dankmeyer, and decided to pursue his education in prosthetics after about eight years in fabrication. After his Associate in Arts from Allegany Community College in Cumberland, he received his Certificate in Prosthetics from Northeast Metro Technical College in Minnesota. Currently residing in Granstville, MD, Mark is the practitioner at our Cumberland, MD office. Mark grew up in a musical family, and continues to write music and sing with his wife Linda at local events. Nina is a Certified Prosthetist Orthotist who joined the Dankmeyer team in 2015 and is originally from San Jose, CA. She completed her BS in Neuroscience at Duke University and then her master's degree in Prosthetics & Orthotics from Northwestern University. 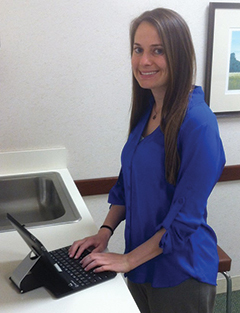 Nina's first exposure to orthotics and prosthetics was during a high school internship at Dankmeyer. She was inspired to work with the Range of Motion Project in Ecuador, a non-profit organization that provides orthotic and prosthetic care to those who cannot aford it. In her spare time she enjoys weight lifting, cooking, and baking. Robert Brown joined the Dankmeyer team in 2018. He earned his bachelor's degree in Orthotics and Prosthetics from the University of Texas Southwestern Medical Center at Dallas in 1988. A Maryland resident, he has worked in a variety of settings and with many different patient populations in the area. His clinical passions are pediatric orthotics and lower limb prosthetics. Robb enjoys seeing the impact the orthoses and prostheses he provides have on a patient's mobility and independence. Rochelle Dumm is a Certified Orthotist and Resident Prosthetist who joined the Dankmeyer team in 2018. She completed her orthotic residency at the University of Michigan. She completed her master's degree in Prosthetics and Orthotics at Georgia Tech. Rochelle has shadowed with us in the past and she is happy to be back. She is particularly interested in working with pediatric patients. Her hobbies include sewing, cooking, and running.